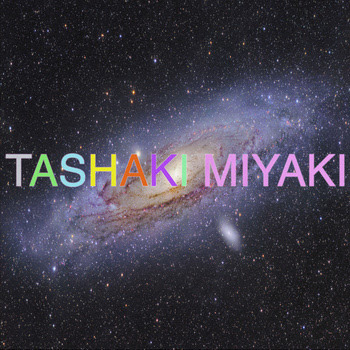 Get lost in Tashaki Miyaki's S/T dream rock cassette. We've had our eye on LA-based Tashaki Miyaki since about a year ago when they covered Sam Cooke's "Nothing Can Change This Love" for Cactus Mouth and Unholy Rhythms' Tears On My Pillow mixtape. That's around the time when I discovered their self-titled EP, which came out late 2011. This month the badass Burger Records re-released these tracks on cassette and we're really excited about it. This fuzzy gem of a tape is the perfect addition to our collection. With galaxy and space-inspired artwork fronting most of their music, it's no surprise that the first word that comes to mind for Tashaki Miyaki is "dreamy." In fact, googling pictures of the milky way and listening to them seem to go hand in hand. It's hard not to think of interstellar clouds floating through stardust when listening to this tape. Almost every song incorporates walls of droning guitar riffs, percussion that echoes like distant salt and pepper shakers, and pretty vocals distorted by reverb. "Something Is Better Than Nothing" shows those exact qualities. This track, as well as others on the tape, are mildly shoegaze but not drowned out to the point where they're My Bloody Valentine's Loveless. Similarly it's easy to compare this duo to Jesus Mary and Chain, especially in a track like "Heartbeat" where hazy female vocals drip like honey into the noisy background. Feedback heavy track "Keep Me In Mind" happened to be my favorite because of its subject matter. Lyrics are everything I want in a love song – "I wanna be the one that's on your mind / I wanna be the one that's by your side / that is true." An alternative version of this track, which is acoustic and accented by the glockenspiel and violin, was also released earlier this month. Although I'm personally keen on the original version, this one is equally beautiful. Washed out, lo-fi track "Happiness" is also jam packed with dream rock melodies. This song, kicked off by a steady drumbeat, is a hopeful one about holding on to someone that makes you happy. Whereas "Get It Right" is a little more heavy-hearted with lyrics like "you're all I ever wanted / who will I love / if I'm not with you." Buy Tashaki Miyaki's limited edition cassette from BURGER RECORDS.